Hi, my name is Ebony and I’m 3 years old. Ebony came into our care with her three kittens. 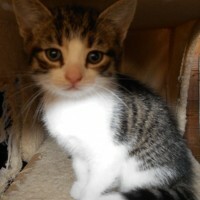 She has been a good mum and her kittens have now moved on to their new homes – Ebony was then looking for her new home. She is very vocal and likes to push up against you for attention! 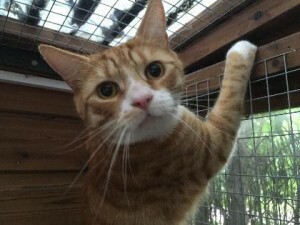 Yay, Ive found my furever home! I’m told that I am the most loving cat. I had been through a very hard time in the previous few months, but I’m now fighting fit and good as new! I came to the lovely people at the RSPCA after my collar got caught under my arm and caused me a really nasty injury. I had to have major surgery, a revolutionary skin graft operation, which I was a bit scared about. But, I was really brave and recovered fantastically, so it was really worth the nerves. I’m so happy, I’ve found my forever home! My previous home was with an elderly person, who didn’t feel up to looking after a young and playful young chap like me. I’m a typical kitten and just love to play! I’m full of life and adore getting lots of fuss and cuddles. Everyone here tells me that I am adorable! Bruce is a lovely Rottweiler boy who came into our care when his owners discovered that he had epilipsey and felt they could not cope with him. Bruce is now on regular medication and his fits are very few and far between. Hi there, my sisters and I have all found our furever homes! Our mummy was brought to our fosterer when she was expecting us. My sisters (Mimi and Butterscotch) and I were born at our lovely fosterer’s house. We lived there for 8 weeks and had a wonderful time. We were given lots of yummy food and lots of toys to play with and our foster mummy loved giving us cuddles. We had such fun! I was living on an industrial site in Hoddesdon and gave birth to my two gorgeous kittens there all alone. I did my best to look after them in the difficult surroundings and managed to give them a good start to life. One day, someone found us there and brought us to the lovely people here to be looked after. At last we were all safe, it was such a relief! Having lived on the streets for a while I was very unsure when we first came here, but my lovely foster mummy has really helped us all to learn to trust humans. I now love nothing better than sitting on a lap and having lots of cuddles. My sister, Sherry, and I were born on an industrial site in Hoddesdon and our mummy (Bella) had to try to raise us to the best of her ability in these difficult surroundings – she really is a lovely and very clever mummy! 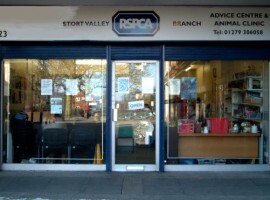 One day someone found us living there and brought us all to the kind people at the local RSPCA to be looked after. We had a lovely foster home and were looked after very well. We were a little shy at first, having never really had much to do with people, but our fosterer helped us to learn to trust humans – we have lots of love to give!